The Time for Compromise is Over! Well Dr. McGuff, admittedly it’s taken a little longer than anticipated but consider your request granted. With the collaborative efforts of the associates of Renaissance Exercise, Ken Hutchins has developed a revolutionary new equipment line that far exceeds what anyone could have expected. Exquisitely handcrafted in Orlando, Florida, these machines are made with the same pioneering spirit that Ken has brought to the industry from the beginning. Only this time, all the stops have been pulled to create products with zero compromise and maximum performance. Production of the new line will be limited and the machines will only be available to applicants who pass a thorough screening process and certification. Already customers have placed orders in anticipation of what’s to come but at last we can give you a glimpse of the future. 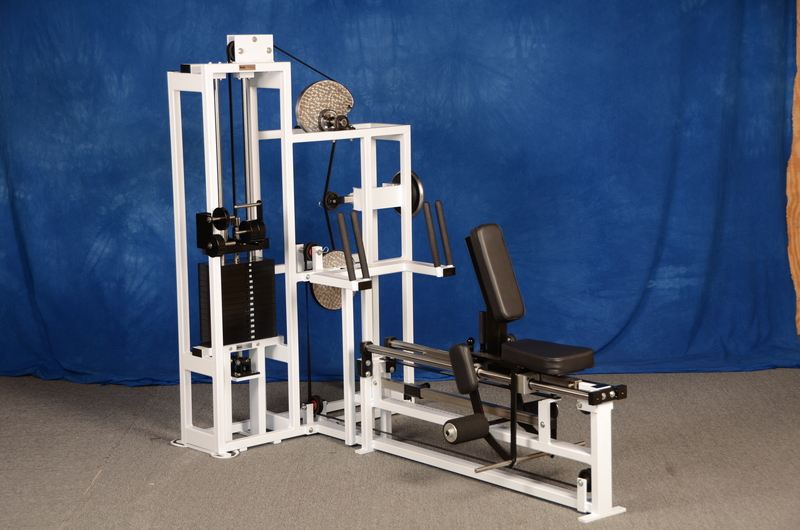 The next generation of Compound Row by Renaissance Exercise Equipment Ltd. continues the unique heritage of Ken Hutchins’ original vision for equipment that bonds the user to the machine. The RenEx Compound Row features an updated silhouette with an all-new body that feels remarkably rigid and secure. The intricate shape, a harmony of sharp angles, drive-belt contours, and exposed mechanisms, fully captures the sophistication of this machine from its offset timing crank to the updated bearing housings under the seat carriage. Plush upholstery and stiff, beefy grips provide exceptionally comfortable feel to the user while Class L shafts and solid aluminum cam and drive wheels help to transmit the efficiency of the newly designed weight stack. As with all the new RenEx dynamic machines, resistance is delivered via the patented UltraGlide® top plate and ‘tunable’ Freedom Stack® which offer unparalleled ultra-low friction movement of the weight stack, precisely engineered for your most intense workout. Start by sliding the seat all the way back to facilitate the simplest entry for any subject without the hassle of complex entry/exit procedures. Then proceed to easily set the start position by releasing a single pull-pin. A similarly simple adjustment allows you to set the micro-adjustable end-point delimiter. Now you can accurately time the variable cam precisely to create the most personalized resistance profile possible and provide a tailored end-point to perform a productive squeeze technique. Just be sure to prepare your client for the breathtaking workout to follow! Whether your goal is to provide your dorsal musculature with muscle-shredding intensity or to successfully help rehabilitate damaged and feeble structures safely and clinically, the Compound Row machine by Renaissance Exercise Equipment Ltd. will perform to your highest expectations. At Renaissance Exercise we are dedicated to developing and crafting the ideal machines for exercise and rehabilitation in concert with our protocol and philosophy. This is just the beginning…..more to come soon! Thanks for posting a picture of it! Like a million guys I’d love to try it to see how if differs from my row machine at home. This will come across as arrogant which isn’t my intent, but the design and function of the exercise cannot be compared to conventional machines. The same is true of the protocol, I’m not arguing better or worse, I’m just saying completely different. This looks phenomenal. I like the mechanism at the bottom to help keep the weight stack plumb, the adjustable range limiter, and also that there are two handle widths for larger and smaller individuals. Being able to move the seat back the trainee rather than having the trainee walk forward into the machine to enter is also a nice touch. The adjustable cam timing is what is really going to set this apart, though, as it did Ken’s “alligator” machines. It looks like you can have as much or as little falloff as you require for just about anyone. All impotant features, there are a few more that aren’t quite so obvious too. Of course I can be accused of being biased, but in my opinion no other machine on the market is even worth mentioning in the same sentence as this thing. How much is the weight stack? The question to be answered is; what is the mechanical work and how does it compare to…? Since those are 20# plates, do u use the variable cam to make small increases in resistance? No more saddle plates, Thank Goodness! Looks GREAT!! Where can one try this? Right now we only have one set with all of the features, they are in our shop in Orlando, but not for long. NICE MODEL!!!!!! Is she a client? She has been training with Gus up in Toronto for at least a few years now. Awesome! HIT is coming back strong and the tools required to make it as efficient as possible have also made giant strides. Looking at what you have achieved and the host of Randys’ CZT machines, exerbotics….all make personal trainers spoilt / confused for choices. All in all a great time for HIT. Awesome effort!!! Josh and Ren Ex team- You Guys are great!!! I love the information presented on this web site and I work every day, like you do, to spread sound information about exercise. I question your statement about resistance produced from a motorized exercise machines. Why does it matter if it is a motor, manual resistance from another person or gravity? It is still resistance and will stimulate the body to respond. If it is don’t with a controlled effort, it seems it could stimulate similar results, and possibly even better results. The eccentric effort can be higher then gravity based systems, which in tern can stimulate better results. I am interested in your thoughts behind your statement. that the body just ABSORBS loads that are beyond its neurological capacity. I define neurological capacity by the capacity that we demonstrate with good motor control, well stabilized, on the positive excursion. Objectively anything outside of our positive volitional effort is outside of our “neurological capacity” meaning that some sort of outside factors must contribute to our ability to “manage” the load. If we try to endure loads that are outside of this capacity the body will absorb these loads with a variety of bracing mechanisms, distribution of a low level stimuli through the entire body. Worst of all the body will bend, notice I didn’t say the joints. I said the body, you’ll see it act like a cushion, the shoulders rise, the spine extends, the joints compress, in the case of the knees, elbows, wrists and ankles, they’ll bend valgus under the loads. I have reason to believe that the bones will even bend, they are not hard and as rigid as people usually think… put enough load on a negative only leg press, something beyond the motor control of the associated musculature and the tibia will bow before the muscle will take any greater force than what the body could engage positively. The body becomes very proficient in protecting its self when/if we don’t initiate with a conscious and volitional effort. The nervous system ALWAYS comes first, you can’t circumvent it, but you can master it. Any modality that steers us away from initiating a contraction outside of our motor control, our neurological capacity will result is a gross over-ridding protective mechanism. The same instinctual mechanism that protects us from fatigue, the same mechanism to protect us from avulsing our tendons right from our bones. I have much more on this subjects, this idea is a huge step in the wrong direction and i suspect this is why Arthur Jones abandoned it. Nautilus or Medx could have easily made these tools, if you saw the price of a new RenEx weight stack you would see why it would be much cheaper to use a motor and a differential, but IT DOESN’T WORK. I will share more in due time, but we require a gravity based system inorder to get to our physiology, harsh mechanical loading, Negative Only, Hyper Reps…..if only it were so easy….you cannot trick or over-ride the nervous system, the human super computer won’t allow it and you should be grateful because if you could hack this systen you would regularly tear tendons right from the bones, I only know this from experience…. much more to come in a future blog post. I’ve been thinking about posting this question as a survey for some time based on comments i see on the H.I.T boards. Does anyone REALLY believe that a muscle can produce more contractile force on the negative? I’m quite aware that we can protect ourselves from excessive load on the negative, but does ANYONE really think that muscle has any more potential to produce force ? Does anyone really think that the direction we are moving is changing force production potential? Whoa…Now Im getting the same warm feeling when I saw a Nautilus Machine for the first time in 81!! The first time I got to see these machines and use them it was unreal how I felt. I actually have some video of some of the RenEx team the first time they got to see the finished products, PRICELESS….kids on christmas don’t even do justice to how i saw these guys react. Fantastic! Can’t wait to see the other machines! Josh you have a great focus and commitment to proper exercise. As well as Ken and Doug so forth. I have been in the field for 38 years. You are doing that which needed for years now. Great Job! Thank You! It’s a labor of love for all of us, all we do is see a constraint and work like mad men to remove it. The time for compromise IS over. The machine looks like it literally belongs on another planet – somewhere in the future. I am certain it functions even better. Congratulations, gentlemen, this is great leap forward in the field of HIT and something that quite frankly hasn’t happened since Arthur Jones. BTW….. I’m friggin jealous I don’t have this kind of phenomenal equipment! I am sure that your well earned success will follow. I can’t decide if these machines are futuristic or if we’ve finally just got our exercise technology up to snuff with other technological advancements. Either way this stuff is FAR ahead of anything on the market. Congratulations on the production of the future of productive exercise!! I can’t wait to experience this first hand. Both Mike and Ray Mentzer would be extremely impressed. WRT the question you posed, I do not feel that a muscle can produce any more force on the negative than the positive, especially on a machine constructed with the sophistication that I’m certain this new line has. I feel the negative is a protective mechanism, as you mentioned. Man i wish I could show Mike this stuff so he could see all of his theory actualized. I hope sometime in the future there will be a facility in Germany offering your unbelieveable machine(s)! Kieser Training is offering a lot of facilities in Germany and Europe using MedX machines for rehab and general training purposes. Maybe this would be an appropriate partner for distributing your RenEx machines in Germany!? If using machines with non-perfect resistance curves, do you think a squeeze technique should be used to intensify the stimulus? Only on exercises of course where there is at least some meaningful resistance at the endpoint of the positive excursion like lat pulldown, leg curl etc.! Or is it better to hold the rep speed consistent throughout the complete range of motion when you are forced to use non-perfect equipment? This equipment and protocol requires an instructor, does Kieser do one on one training? As far as I know Kieser manufacturers MedX, but I’m open to discussion. I think Kieser only offers one on one instruction only in the rehab Department of their facilities. It was just an idea of me…I am just a motivated trainee and have no connection to Kieser. But maybe there is a market for them in the future using your Machines. I noticed someone advocating motor driven exercise units in stead of gravity based exercise units. As I understand things the limiting factor would be the feed back loop in such a unit would be competing with the feedback loop that you are producing in response to (your) changing state of moment to moment. Thus it would create eratic exercise by adding additional controll issues. Mudding up the performance so to speak. In the final analysis What the Renex team is removing the any limitations offered by the exercise tool so that in the end all limitations would come from the subject. YES Russ! the equipment needs to be designed to get out of your way. i agree with your concerns and i think there are a number of other really big issues with these devices. It is a BIG step in the wrong direction, harsh mechanical loading is a big dud. trust me it’s much cheaper and easier to build these trash compactors. We’ll be writing more on this subject. Previous post: Where Does Innovation Come From?